The canyon is not just beautiful, it is also the world’s best exposure of layered rock, with layers stretching back in time 1.4 billion years. Our guide today was Ivo Lucchita, a geologist who has spent his whole career studying the canyon, and he told us the story that is hidden in the layers of the canyon. I will try to relay a little bit of it here. The story begins 1.4 billion years ago as the North American continent was forming. The continental plate collided with an island arc (similar to Japan), and that collision compressed some of the rocks of the continent, folding the layers like an accordion and altering the minerals. This resulted in the Vishnu schist, which is the lowest layer of the canyon. The schist was then planed off by erosion for thousands of square kilometers. You might wonder how erosion would carve rocks into a perfectly flat surface, but you can see it happening today anywhere that the ocean is crashing against steep cliffs. Waves only erode down to a certain depth, so as they eat away at sea cliffs, they create a flat erosional surface. After that surface was planed off, a thick stack of layers was deposited in a wide variety of environments ranging from deep oceans to arid deserts. This was all during the Proterozoic, when the only life was simple and single-celled. 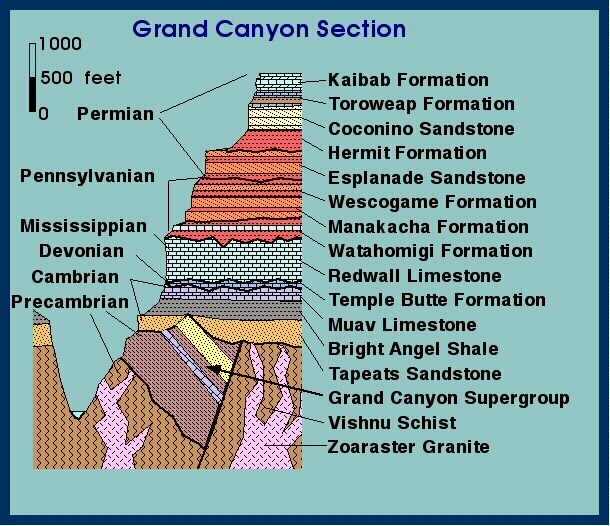 This stack of Proterozoic layers is called the Grand Canyon supergroup, and ends with the Chuar group, which was laid down about 750 million years ago and contains fossils of the first blue-green algae. The proliferation of algae marked a significant transition for the earth because all that photosynthesis changed the atmosphere, enriching it in oxygen. 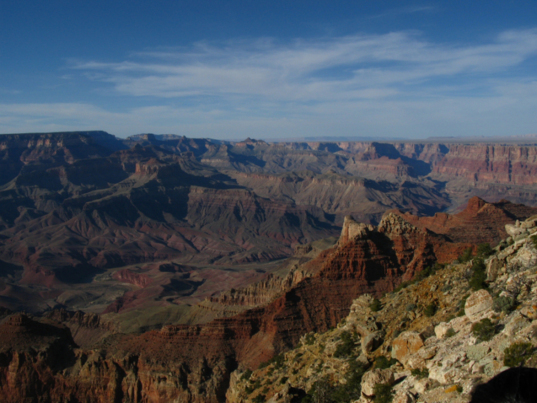 The layers of the grand canyon supergroup are now tilted with respect to the rest of the overlying layers of the canyon, probably due to tectonics related to the early North American plate. 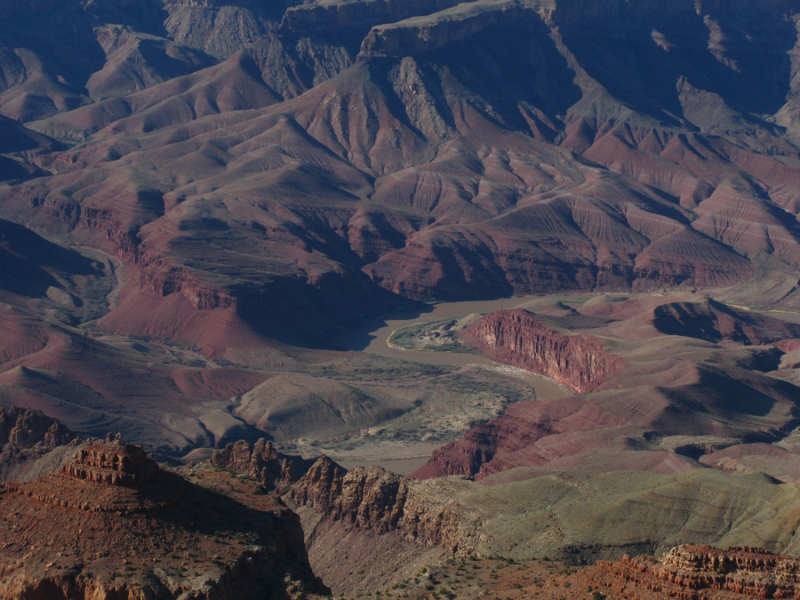 The red and white-striped eroded surface shown here near the river is the tilted Grand Canyon supergroup, deposited over about a billion years during the Proterozoic, prior to multicellular life. The flat shore near the bend in the river is one location that was settled and farmed by Native Americans a few thousand years BC. After the Proterozoic layers were tilted and eroded, most of the rest of the layers were deposited over the next half a billion years during the Paleozoic. Once again, these layers represent wildly varying climates and settings, from oceans to deserts to floodplains, to shorelines. During the Paleozoic, life became phenomenally successful, developing from algae into complex marine animals and amphibians. The layers above the tilted lower strata were deposited between 545 and 260 million years ago during the Paleozoic, during which time life advance from algae to amphibians. The Paleozoic ended with the great Permian extinction, in which 98% of all species died off. After the Paleozoic came the Mesozoic: the age of reptiles. Many more layers were deposited, but they have been eroded away again. The erosion stopped at the rim of the canyon because it is made of the very tough Kaibab limestone.To find the mesozoic layers, you have to travel to the nearby painted desert. More recently in the cenozoic, which began 65 million years ago with the extinction of the dinosaurs, and marks the beginning of the “Age of mammals”, there were more continent collisions, causing the uplift of the Colorado plateau, and many faults and volcanoes. At some point, the direction of drainage in the area reversed, and the early Colorado river changed course to its present location. Oddly enough it is not well understood exactly how the river ended up the way it is today. There are a lot of subtleties to the Colorado river that are quite confusing when considered with the vast changes in geography of the area over the last few million years. In any case the canyon is likely not that old compared to the rocks that it cuts, and may be as young as 4 million years old. Finally, one of the most interesting things that we talked about today is the early settlement of the canyon by native people. Apparently a few thousand years ago the river carried a huge load of sediment, and actually behaved much like the Nile, with floods and the meandering course of the river in its bed crating fertile lands on the banks. Ivo told us about some studies of charcoal layers found in the soils of the river banks that also contained maize pollen, indicating that there was farming in the canyon at least 3094 BC! That’s the same time period in which Nebuchadnezzar ruled Egypt and Moses would have lived! Update: a friend of mine corrected me on this. I was trying to remember what Ivo said during our field trip and he in turn was remembering off the top of his head, so things got a bit jumbled. Here’s the real deal, which is actually even more impressive! - Moses is usually placed (for example by Flavius Josephus) in either the reign of Ramesses II, or his predecessor, or his successor — at any rate one of the pharaohs of the 19th Dynasty. The 19th Dynasty lasted from 1292 to 1190 BC, not 3094 BC. 3000 BC even predates the time of Abraham (~2000 BC or later — a lot of people like to place the story of Joseph, Abraham’s great-grandson, in the Hyksos period, around 1600 BC). - Nebuchadnezzar was a king of the Neo-Babylonian period. 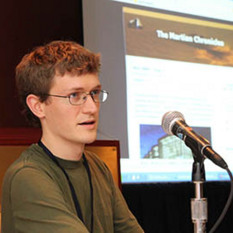 Wikipedia gives his dates as 630 to 562 BC. So that is even later than Moses...Nebuchadnezzar led the Babylonians in a campaign against Egypt (then ruled by pharaohs of the 26th dynasty) but evidently did not succeed in conquering it. 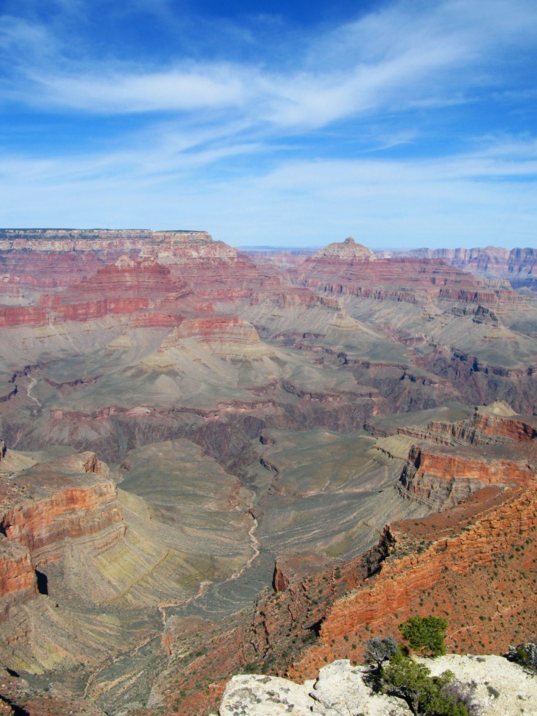 If the Grand Canyon remains are really from the 31st century BC, then they are even older than the Pyramids. They’d be roughly contemporary with Narmer and the Egyptian 1st Dynasty. 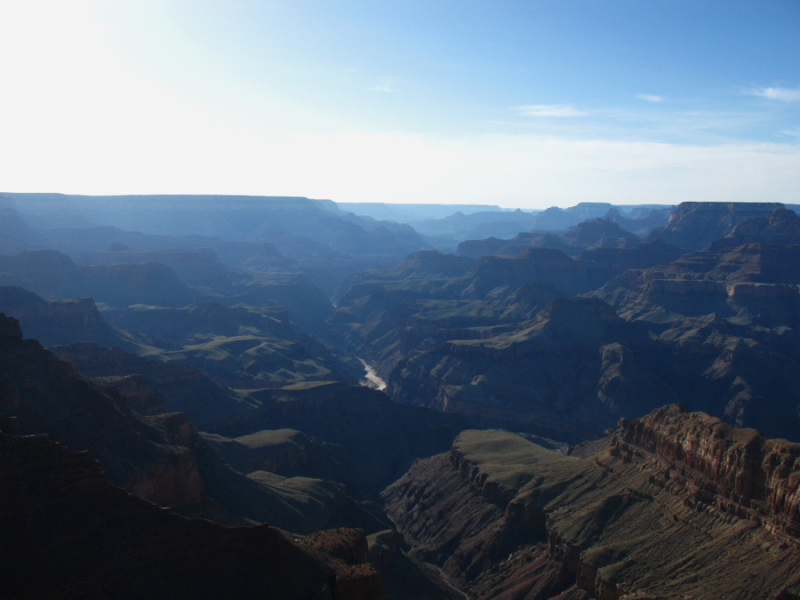 The Grand Canyon is amazing. The history of the earth is laid bare in front of you, and the story that it tells is as overwhelming in scale as the canyon itself. The stretch of river visible is one of the largest rapids in the canyon and is about a mile long.